Glou Morceau is a traditional Belgian dessert pear, highly regarded for its quality and delicacy of flavour. The flesh is of the soft melting buttery consistency which is characteristic of continental pears, with a rich sweet flavour. If you are looking for an old-fashioned dessert pear this is a good choice. Please fill in the details below and we will let you know when Glou Morceau pear trees are back in stock. A classic 19th century winter pear with a high quality flavour. Glou Morceau is in flowering group 2. Glou Morceau is self-sterile and needs to be pollinated by another tree of a different variety nearby. 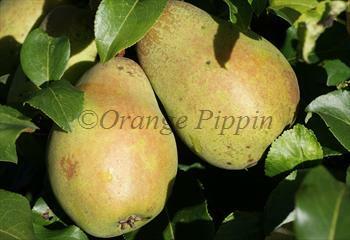 As with many continental pears, Glou Morceau grows best in areas with dry climates and good levels of sunshine. A sheltered south-facing aspect will get the best results, and if these conditions are met it is a reliable cropper. Glou Morceau is a moderately vigorous tree, and can sometimes set an over-heavy crop, in which case thin the fruitlets during June - this will reduce the burden on the tree and ensure better flavour and fruit size. The pears should be picked before they soften on the tree. Glou Morceau was raised by M. Hardenpont in the town of Mons, Belgium, in the mid-18th century.